What do you mean, February isn't the time to be thinking about Halloween? It's perfect time! 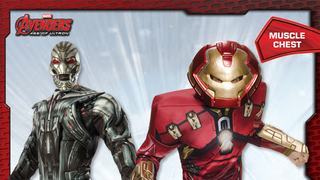 Plus, you're going to need the next 8 months to recover from the screaming/laughing fit you'll get from these official Age of Ultron costumes. Look at that Ultron mask. Look at it. Wow. I'd say I don't know where to start - there's just so much going on - but it's actually easy. OH MY GOD THAT FAKE TONY GOATEE. The look on the guy's face! I genuinely can't tell if it's just hilariously fake looking or if it's actually photoshopped on. That's a thing you can buy. A replica of Robert Downey Jr,'s facial hair. 2015 people. Humanity has achieved peak greatness. It's all downhill from here. Check out the full gallery of nightmares and delights below.